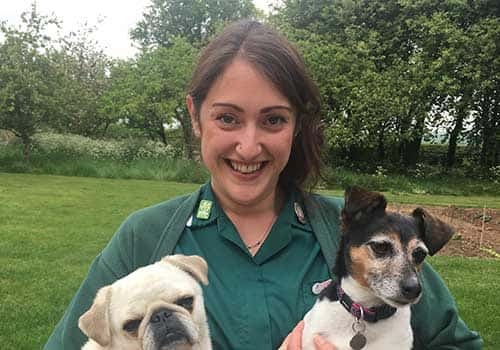 I have been at Fairfield during the entirety of my nurse training and recently completed my BSc (hons) Veterinary Nursing degree in June of 2016 for which I received a 2.1. This training has taken me four years of hard studying alongside working here at Fairfield’s, combining theory with essential practical knowledge. Prior to starting this training I tried out a few different career paths, including qualifying as a Chef! I now know my true calling is in the veterinary world. Being from a farming background I have grown up surrounded by animals my whole life. This started my passion for caring for animals and has carried on in to my adult life. I am a qualified pet health counsellor and have several active weight clinics at the practice. I find running these clinics especially rewarding and love educating clients in helping their pets to lose weight. I hope to branch out into running more client consults, including mobility and geriatric clinics. I have four dogs of my own at home which include a Labrador and a Springer Spaniel who are both working gundogs. I also have a Jack Russell and a Pug, and I enjoy spending as much of my free time with them as possible. I love all creatures great and small, and enjoy the diversity of working here at Fairfield’s, as each day offers a different challenge or animal to meet.